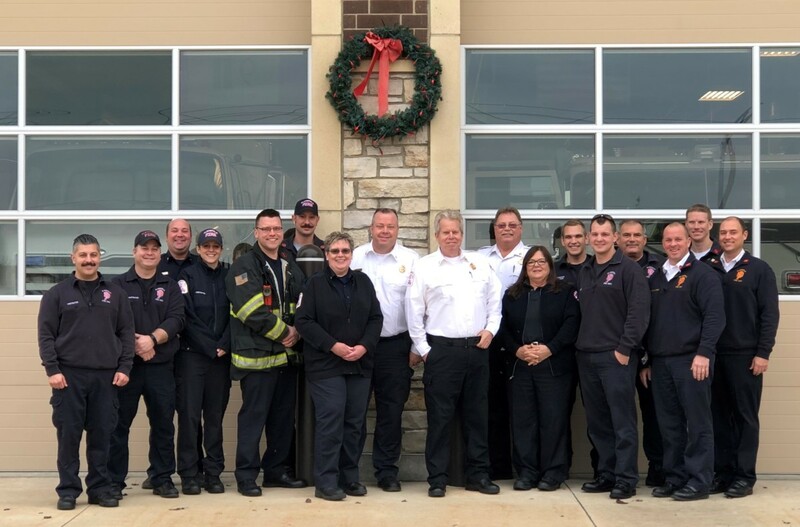 The Plainfield Fire Protection District is participating in the area wide annual holiday fire safety campaign “Keep the Wreath Red” to raise awareness of fire safety during the holiday season. All fire stations are decorated with a holiday wreath with red lights. If there’s a fire caused by a holiday decoration then a red light will be replaced with a white light. Our goal, with everyone’s help, is to keep the wreaths red this holiday season. Candle fires are the most common cause of holiday decoration fires and overall December is the peak month of the year for residential candle fires. Candles being placed too close to things that could catch fire is the most common cause of candle related fires. Keep candles at least 12 inches away from anything that can burn. Use sturdy candle holders that won’t tip over. Always blow out candles before leaving a room or going to bed. Never leave a child or a pet alone in a room with a burning candle. Never use a candle if oxygen is used in your home. Please consider decorating with flame-less candles that can look and smell like real candles. When decorating with holiday lights and other electric powered devices make sure they are listed by a qualified testing laboratory for safety. Inspect light strings before using them and replace any string of lights with worn or broken cords or loose bulb connections. Read the manufacturer’s instructions for the maximum number of light strings to connect. When decorating outside make sure you are using outdoor rated electrical decorations and cords. Use clips, not nails, to hang lights so cords don’t get damaged. Always turn off decorations before leaving your home or going to bed. When buying a fresh cut Christmas tree check to make sure the needles do not fall off when touched. Cut 2 inches from the base of the trunk before placing the tree in the stand. Locate your Christmas tree so it is at least 3 feet away from heat sources and is not blocking an exit. Make sure to add water to the stand daily to keep the Christmas tree fresh. Remove the Christmas tree from your home as soon as it begins to show signs of drying out because a dry tree is a fire hazard. Locate the dry tree outside and away from your home, garage or other structures while waiting for disposal. With everyone’s help we can “Keep the Wreath Red” this holiday season. For more information about holiday fire safety call us at 815-436-5335 ext. 7314 or visit our web site at PlainfieldFPD.com. The Plainfield Fire Protection District wishes everyone a Happy and Safe Holiday Season!